A water damage emergency is a situation in which you have no control. However, whether your home suffers from subsequent mold damage IS something that you can effect. Mold spores are always present in the air, therefore your wet home is fertile ground for a problem. Since subsequent mold growth begins 24-48 hours after unwanted water, the key is to clean up quickly. 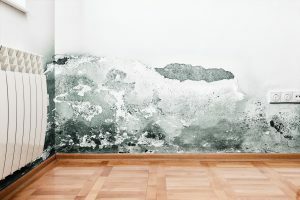 To avoid a secondary problem after water damage, the easiest way to deal with mold is to stop it from forming in the first place. If materials are wet and can’t be cleaned or completely dried, remove them from the home. When possible, replace them with new materials which may be more mold resistant. For example, fiberglass insulation won’t have the food source that traditional paper backed insulation does. If replacing drywall, choose a board that that contains mold and moisture inhibitors. Clear out wet clothes, damp books, and damaged cardboard boxes. All organic food sources will continue to feed the mold colonies and create more problems in the future. Resist the urge to move problems to the basement or garage “to deal with later.” The time is now! Mold hates well-ventilated spaces. Therefore, use every tool in your arsenal. Maximize airflow from any box fans and keep as many windows and doors open as possible. Create cross ventilation when possible and take advantage of second story ‘chimneys’ to pull moisture up and out of the house. Hang damp towels to dry entirely. Hang them folded in a manner to allow air to pass through them to avoid that sour smell. The same goes for sponges—don’t just leave a sopping-wet sponge in a puddle in the sink. When you’re done with them, wring them out well and put them somewhere where they can dry out completely, like a sponge holder. After the original water damage, check the exterior of homes and buildings regularly for accumulating ground water. When the ground is saturated mold can begin to form outside and find its way inside. If water continues to accumulate against your foundation, take measures to drain the water away from your building. Keeping things dry is the key to preventing mold growth. When your home suffers from water damage, call Restore Rite, available 24 hours a day to 1) clean up minor or major water disasters and 2) prevent secondary mold infestations. Whether your water damage came in the windows, a broken pipe, or a hole in the roof, you will need professional, certified and experienced help. Whenever a resident in Idaho Falls calls with a water damage emergency, the team responds immediately. Experts assess the amount of damage and then create a plan of action to restore the property as quickly and efficiently as possible.